The past month has been a busy one for me. It was mostly spent with family. Spending time with the grandchildren and their families. Spending time with my DH and his airplane. Here we are at a gathering in Illinois. Quite a flight from Georgia. I also managed to get a little quilting done. If you have any young girls around you know how popular the characters from "Frozen" are. I made these two little quilts for the granddaughters. 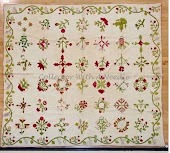 My September Benjamin Biggs block all stitched. Last months Noah and Matilda blocks. 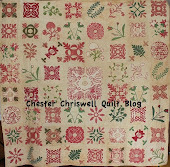 I have also started stitching on the Di Ford Mystery quilt. I must say I am not loving this one because of the difficulty I am having getting all this broderie perse appliqué to fit in the space allowed. Lovely spending time with family - I'm always happy to do that! 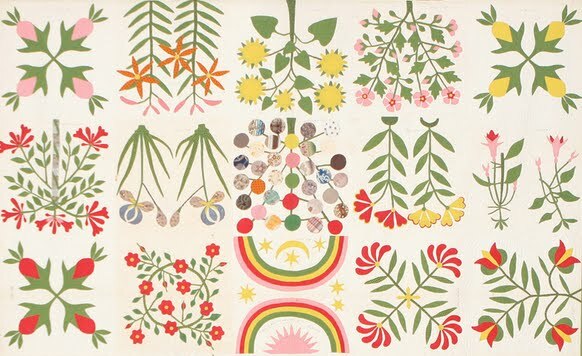 You have made great progress - beautiful applique blocks! Great family snaps and I just love the colours of hubby's airplane! All of your BB and Noah Matilda blocks are just beautiful, your fabric choices are A1. I'll bet those "Frozen" quilts are a hit! Your applique looks beautiful. I enlarged each one and had a good look. I marvel at those of you who can do this--and do it so well! Spending time with grand kids and family is the best. Beautiful plane, what an exciting hobby. Your appliqué blocks are all so pretty. Great plane! Is it a Stearman? My dad just sold his Stearman and I was so disappointed. Your Di Ford looks wonderful!! Gorgeous bi-plane! What fun for you both...I miss those days when my own DH was flying and we would go on adventures. Your Benjamin Biggs block is lovely - I am trying to catch up. And your other applique blocks are really coming along too. So nice to see you have started on the Di Ford Mystery too, and the beginning of it looks quite promising. But you are quite right, it is a real challenge to get all the broderie perse tucked between the bows of the center... I really love your new blocks of Benjamin Biggs and Noah&Mathilda too (which are on my wishlist, especially N&M). Wonderful to hear you've been spending time with your beautiful family! Hubby's plane is quite a beauty too. Your Noah & Matilda blocks and Ben Biggs are all quite stunning! Your work is always gorgeous! I think you are off to an awesome start on your Di Ford quilt too. I love seeing the family pictures! Your blocks are all so pretty. I especially like the Noah and Matilda blocks - always such pretty fabric combinations. Thanks for sharing!! Loved seeing what you've been up to. What an airplane and what a ride! You appliqué is super as always. I had a hard time fitting in the BP appliqué pieces too, but I added what I could and it turned out okay. Oh, wow!! What a super cool plane!! How fun to spend time with family - sooooo important!! And of course your blocks are as always . . . fabboo!! your grandchildren are so sweet and handsome. 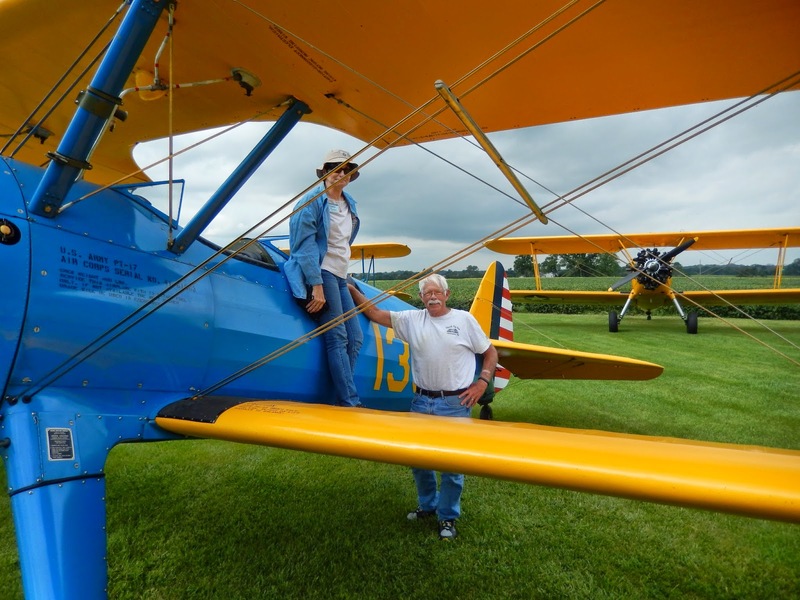 How cool that you and your husband fly that biplane. Even though you had problems with the last block it sure is pretty. Your blocks are beautiful! It is always so lovely to spend time with the family.